Now I am ready to market all that work to other teachers and performers. As it gets in shape for others to access, it will be posted on this site. My musicals are written for elementary students, but many are appropriate for older students, through middle school. Some were written for first or second graders and some for fourth or fifth graders. When the musicals are listed here, expect to find a plot synopsis, number of speaking parts, instrumentation, approximate performance time, a list of musical numbers, and appropriate ages of performers. 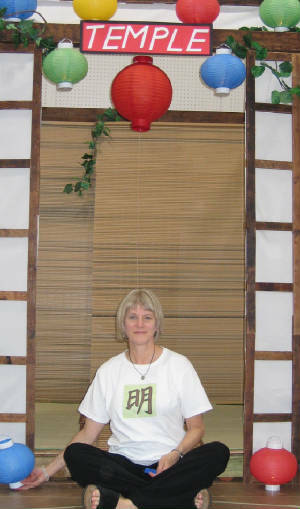 Lana in the temple door of her musical, "The Tanuki Band of Shojoji." To provide access to elementary music that has been used and refined by and for elementary children. To provide access to my music for members of the choral community. To engage in dialog with elementary school teachers and choral directors, to tailor my future work to their needs. "Rocks In My Head" about geology and the rock cycle. As an added bonus, the music is in "rock"style. "Celebrate the Ocean" about the sea and its creatures. "Fiestas Mexicanas" about Mexican history and culture. "A Sound Performance" about the science of sound. "Weather Is Everywhere" about the weather. "The Tanuki Band Of Shojoji" a folk tale from Japan. "The Legend Of Knockgrafton" a folk tale from Ireland. "The Bremen Town Musicians" a folk tale from England. "The Principal Mystery" about a principal who got "stolen." "The Mysterious Disappearance of Jack Frost" good for winter. "Lost On the Moon" about a time in the future when rockets go everywhere you want them to. "Adventure In the Black Forest" good for October. "How Santa Claus Met the Elves" good for December.